Malcolm Everard MacLaren Pearson, Baron Pearson of Rannoch (born 20 July 1942) is a businessman and UKIP member of the House of Lords. Educated at Eton College, Pearson is chairman of the Pearson Webb Springbett (PWS) Group of reinsurance brokers, which he founded in 1964. 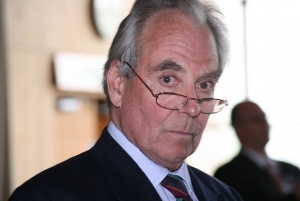 He was made a life peer on 18 June 1990 as Baron Pearson of Rannoch, of Bridge of Gaur in the District of Perth and Kinross, sitting as a Conservative. Pearson is a eurosceptic of long standing. In May 2004, he called for voters to back the UK Independence Party (UKIP). Along with three other Conservative peers, he was then expelled by the Conservative Party on 30 May. He subsequently said that he would probably sit as an "independent Conservative". He threatened to quit the Tories to join UKIP, which he did on 7 January 2007, along with Leopold Verney, (21st Baron Willoughby de Broke) He criticised the Tory party's leadership for being "silly" and argued that they should try to get UKIP members back into the fold by adopting more anti-European Union policies themselves. He has tabled a number of unsuccessful Private Member's Bills in the House of Lords demanding Britain's immediate withdrawal from the European Union. In November 2006 he tabled the European Union (Implications of Withdrawal) Bill 2006-07 which calls for the establishment of a Committee of Inquiry into the implications of UK withdrawal from the European Union. Also, he joined the United Kingdom Independence Party sometime afterwards, citing David Cameron's refusal to tell the British people about the disadvantages they suffer because Britain is a member of the EU. He is one of the co-founders of an anti-EU think-tank, Global Britain, which has campaigned against alleged pro-EU bias at the BBC. Others include UKIP donor Patrick Barbour. He is a strong supporter of the pro-hunting Countryside Alliance, serving as chairman of its deerstalking committee. "Lord Pearson speaking at the Free Speech Summit, 5 May 2009"
Pearson attended the 2009 Washington D.C. conference 'International Legal Conference on Freedom of Speech and Religion', organised by the International Civil Liberties Alliance (ICLA), a prominent organisation in the counterjihad movement. Well-known American anti-Muslim activists Pamela Geller and Robert Spencer, who were later banned from entering the UK by the Home Secretary, also attended. "Lord Pearson in an interview with former EDL leader Stephen Lennon, March 2018 at the Houses of Parliament"
7 December 2015 - To ask Her Majesty’s Government whether, as part of their counter-terrorism strategy, they will encourage a national debate about the nature of Islam, including whether the Muslim tenets of Al Hijra, Taqiya, and Abrogation remain valid today. 7 December 2015 - To ask Her Majesty’s Government, further to the reply by Earl Howe on 2 December (HL Deb, col 1193), what actions will be criminalised from next April under the specific offence of anti-Muslim hatred, and whether the actions criminalised under that offence will include (1) criticism of the Muslim religion, and (2) statements from people who have left that religion explaining why they have done so. March 2018: Pearson asked during a House of Lords debate on hate speech: "Does hate speech include criticising Islam or any of the world's great religions as opposed to insulting their adherents? And "Does our legislation make that distinction and, if not, should it not do so?" Pearson has been married three times: to Francesca Frua de Angeli in 1965, with whom he had one daughter and divorced 1970; to the Hon. Mary Charteris in 1977, with whom he had two daughters and divorced 1995; and to Caroline St Vincent Rose in 1997. ↑ 9.0 9.1 Nafeez Ahmed, A Fourth Reich is rising across Europe — with ties to Donald Trump and Vladimir Putin, Medium, 22 June 2016. Accessed 5 October 2016. ↑ Greg Heffer, UKIP peer Lord Pearson invites ex-EDL leader Tommy Robinson to Parliament, Sky News, 15 March 2018, accessed same day. ↑ They Work For You: Previous business; Monday, 12 December 2016, They Work For You, accessed 13 December 2016. ↑ speaker:Lord Pearson of Rannoch, They Work For You, accessed 13 December 2016. This page was last modified on 16 March 2018, at 04:59.